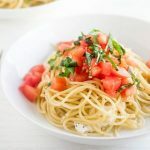 This easy caprese pasta recipe is ready in just half an hour and is perfect for busy weeknights! 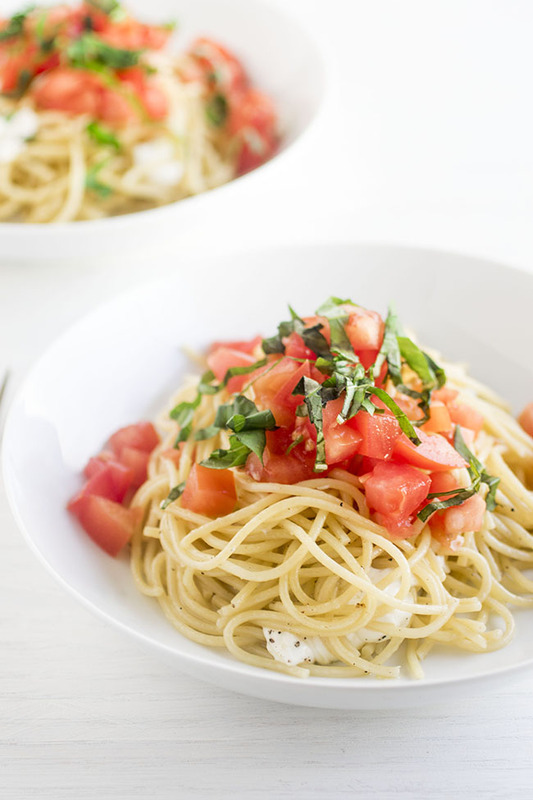 Fresh tomatoes, mozzarella, and basil come together in a delicious chicken pasta recipe. Simple meals = the best meals. I’ve been struggling lately with the whole “making dinner that is actually dinner and not just a toasted bagel” thing. We’ve been so busy that by the time we land on our couch at the end of the day, we’re totally wiped out. Which means cooking sounds juuuuuuuust terrible. I’m actually pretty sure we’ve ordered pizza in every week of 2016 so far. And while we’re being honest with each other (which obviously we are because INTERNET FRIENDS), I will also tell you that more often than not our pizza ordering ends up being 2 or 3 pizzas because if we do THAT, we save like FIVE WHOLE DOLLARS (coupons = winning) and – BONUS – we don’t have to cook for another three days because LEFTOVERS. (We’re really, REALLY GOOD at adulting). But this morning, I woke up craving … I don’t know. Nutrients? Something fresh. Something that was not leftovers. Something that perhaps involved protein and/or vegetables. Something bright and summery (even though it’s February). And what do we do when we’re craving fresh, bright, kind-of-nutritious summer-ish food things? 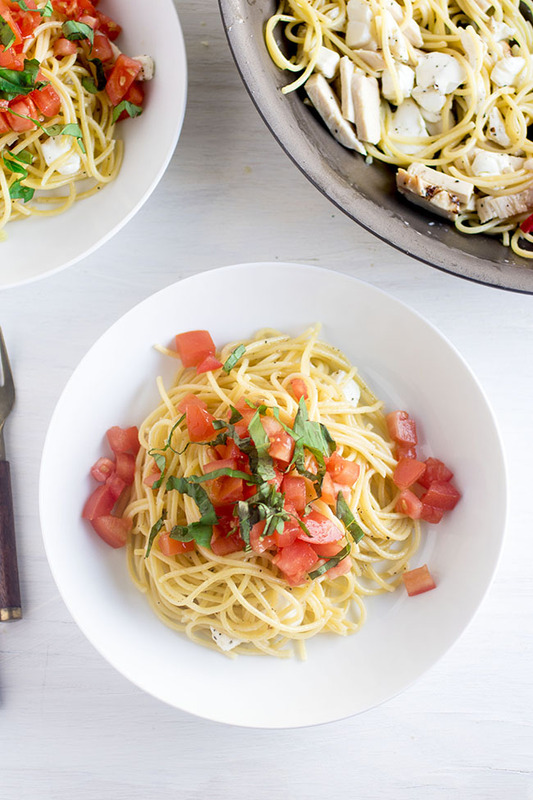 This chicken caprese pasta is the perfect quick-fresh-flavorful dinner. It’s also ready in less than half an hour so you can get back to re-watching 30 Rock on Netflix for the 500th time being a productive, responsible adult. (PS – this tastes SO much better than pizza). 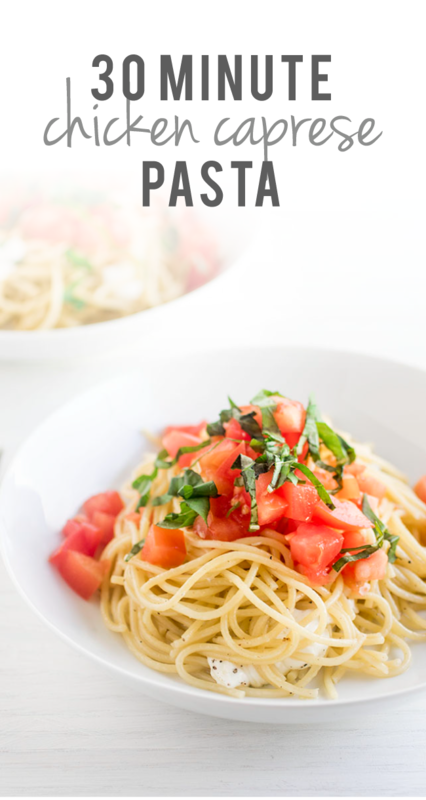 An easy weeknight pasta recipe. 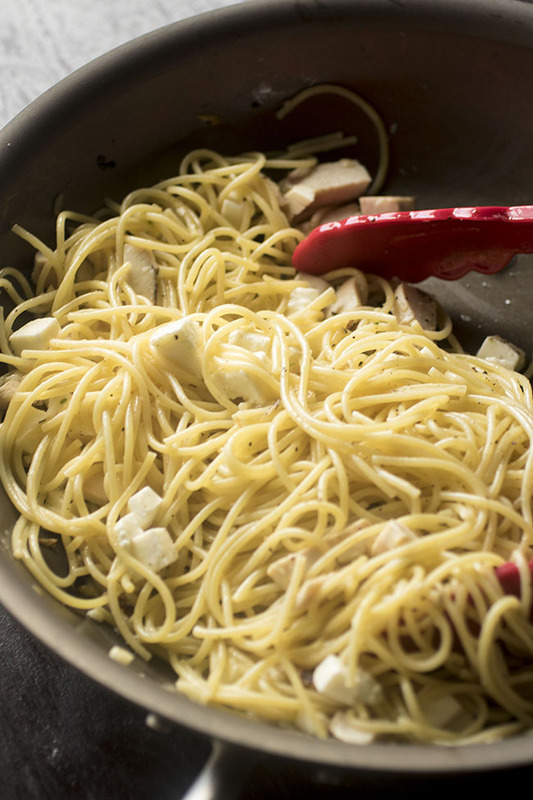 Cook the spaghetti in very salty water until al dente. Drain and set aside. Heat 2 Tbsp. of the olive oil in a large skillet over medium heat. Add garlic and sauté 1-2 minutes until fragrant. Add chicken pieces to skillet and cook until chicken is heated through, about 2 minutes. Remove skillet from heat. Add pasta and diced mozzarella to skillet and toss with kitchen tongs to combine. 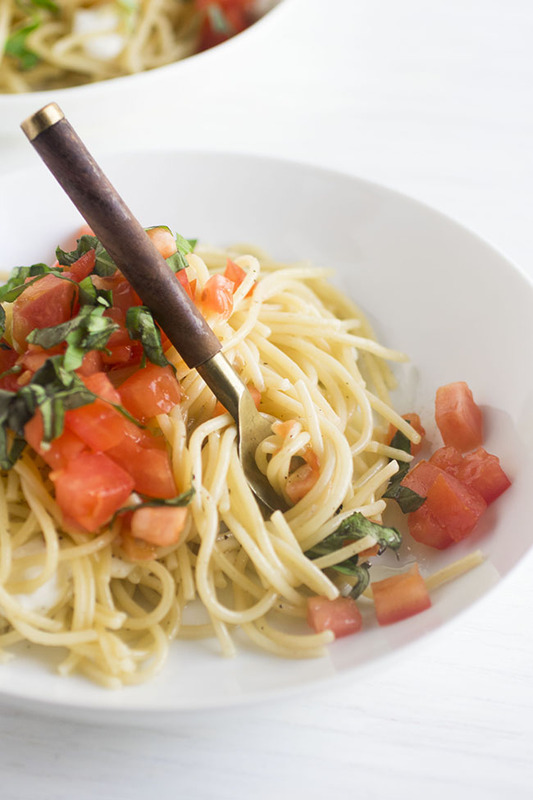 Drizzle in just enough of the remaining olive oil to lightly coat the pasta – you may not need it all. Add a generous pinch of salt and freshly ground pepper to the pasta and toss to combine. 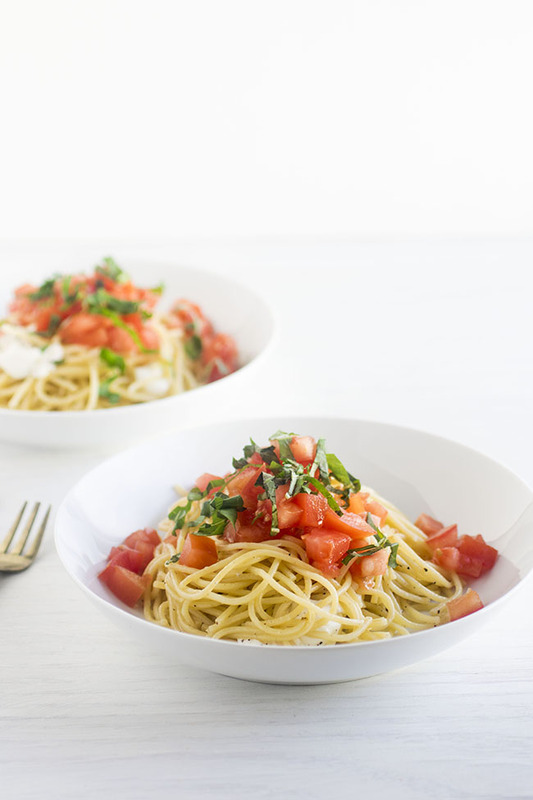 Divide pasta between plates and top with diced tomatoes and fresh basil. Serve immediately. 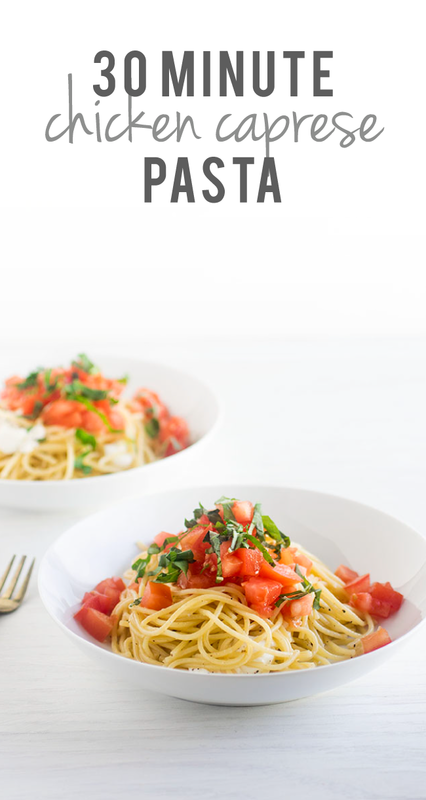 You could also top this pasta with some freshly grated parmesan cheese or a drizzle of balsamic reduction to mix it up a bit. Don’t be afraid of seasoning – be sure to add salt and pepper to the finished dish to help bring everything together! Leave out the chicken to make this a vegetarian dish. 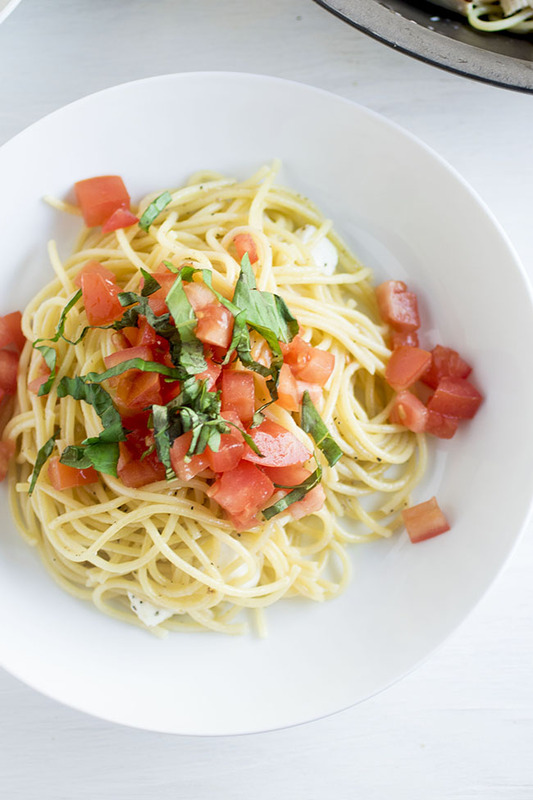 Use high-quality olive oil for this recipe – it makes all the difference! We like to keep a bunch of grilled chicken in our fridge to use in recipes like this throughout the week. If you don’t have pre-cooked chicken on hand, just dice up two raw boneless, skinless chicken breasts and sauté the pieces in a bit of olive oil until cooked through (do this between recipe steps 2 and 3), then proceed as directed by the recipe. Hi there! 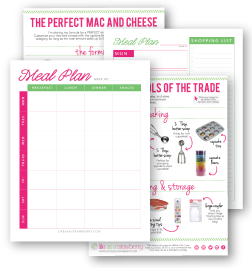 New follower here, and really excited to be subscribed to your blog! Anywho, I was craving “fresh, bright, kind-of-nutritious summer-ish food” (since its in the 80s here in southern Cali) lol and decided to CAPRESE. Followed this recipe today and it was awesome! Can’t wait to try other dishes!